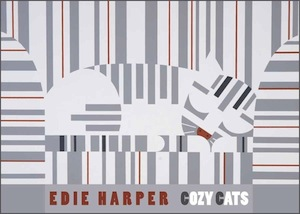 Edie Harper (American, 1922—2010) was trained at the Art Academy of Cincinnati, where she studied printmaking with Maybelle and Wilson Stamper and color theory with Josef Albers. She is best known as a painter, photographer, and illustrator, although she created a rich body of work in other media—jewelry, enamels, sculpture, silkscreen prints, and weavings. Her work has been featured in Graphic Content at Cincinnati’s Contemporary Arts Center and in Minimal Realism at the Cincinnati Art Museum. She also illustrated the children’s book My Nose Is Running, by Louise Bonnett-Rampersaud.